The 2202D Digital Cathetometer with a custom range and working distance to suit. Kingsview Optical manufactures the 2202D digital cathetometer to give repeatable non contact measurements of samples which are either far away or in harsh environments where it is not possible to get access to. The 2202D is fitted with a digital scale with a resolution of 10 micron. It has the option of having USB camera added as an extra should you require making documenting your results easier. The 2202D digital cathetometer consists of a telescope mounted on a carriage bar which runs on a stainless steel precision ground bar. The lower end of the bar is fitted with a sleeve which runs into an accurately ground gunmetal bush in the cast iron tripod base. The telescope has adjustable focus and with the aid of close up lenses can be used from 300mm to infinity but the customer will need to specify the working distance needed and we would supply a lens to suit. Should the customer want to use it at a range of working distances we could supply more lenses to suit as an extra. A x10 Ramsden eyepiece fitted as standard is supplied with a crossline reticule. 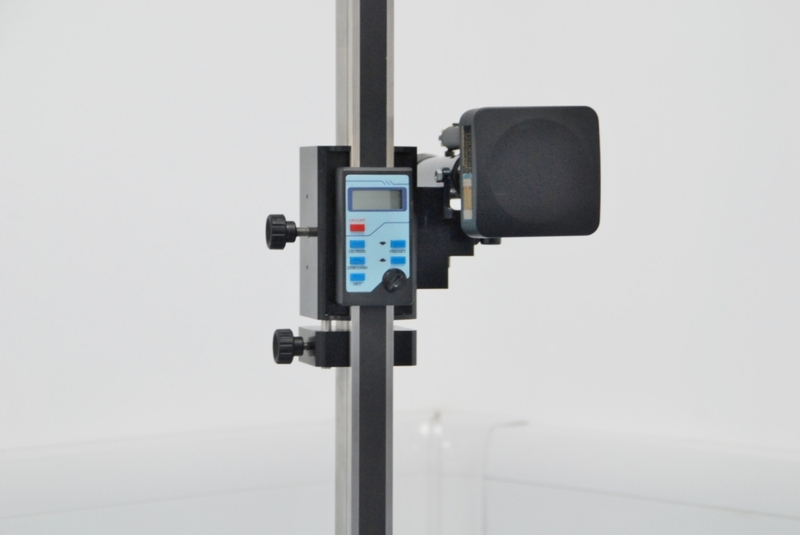 The standard vertical range of measurement is 500mm.